Blood Vessels are often compared to a system of pipes with liquid circulating in them, but this analogy is only a starting point. Unlike pipes, blood vessels are extremely dynamic structures that constrict, relax, pulsate, and proliferate. 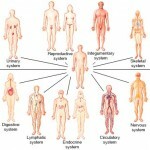 In this article, we’ll examine the structure and function of these important circulatory pathways. 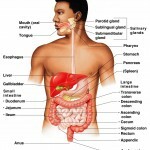 Blood vessels within the body form a closed delivery system that begins and ends at the heart. The idea of blood circulating through the body isn’t a new one. In fact, it dates back to the 1620’s, when it was originally inspired by William Harvey, an English physician. There are three major types of blood vessels: arteries, capillaries, and veins. 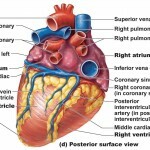 As the heart contracts, it forces blood into the large arteries leaving the ventricles. Blood then moves into smaller arteries successively, until finally reaching the smallest branches, the arterioles, which feed into the capillary beds of organs and tissues. Blood drains from the capillaries into venules, the smallest veins, and then into larger veins that merge and ultimately empty into the heart. If you stretched out all of the blood vessels in the human body, they would be 100,00 km (60,000 miles) long! om the lungs to the heart. The only blood vessels that have intimate contact with tissue cells in the human body are capillaries. In this way, they help serve cellular needs. 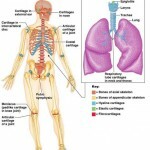 Exchanges between the blood and tissue cells occur primarily through the thin capillary walls. The walls of all blood vessels, except the smallest, have three layers, or tunics, that surround a central blood-containing space, the vessel lumen. The innermost tunic is the tunica intima. The tunica intima contains the endothelium, the simple squamous epithelium that lines the lumen of all vessels. 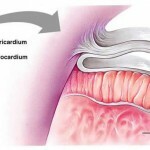 The endothelium is continuous with the endocardial lining of the heart, and its flat cells fit closely together, forming a slippery surface that minimizes friction so blood moves smoothly through the lumen. In vessels larger than 1 mm in diameter, a subendothelial layer, consisting of a basement membrane and loose connective tissue, supports the endothelium. 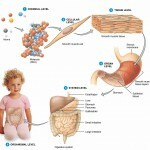 The middle tunic, the tunica media, is mostly circularly arranged smooth muscle cells and sheets of elastin. 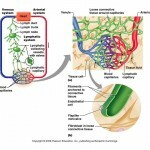 The activity of the smooth muscle is regulated by sympathetic vasomotor nerve fibers of the autonomic nervous system and chemicals. 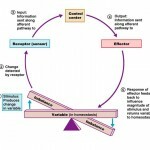 Depending on the body’s needs at any given moment, regulation causes either vasoconstriction (lumen diameter decreases) or vasodilation (lumen diameter increases). The activities of the tunica media are critical in regulating the circulatory system because small changes in vessel diameter greatly influence blood flow and blood pressure. Generally, the tunica media is the bulkiest layer in arteries, which bear the chief responsibility for maintaining blood pressure and proper circulation. 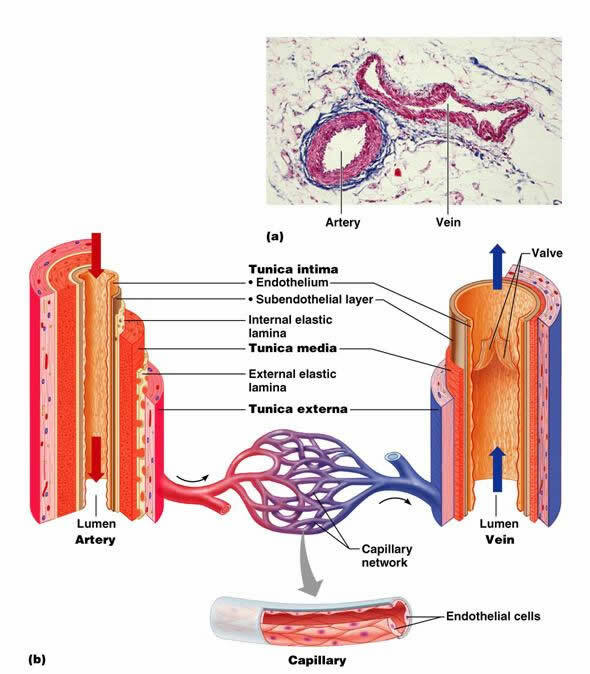 The outer layer of a blood vessel wall, the tunica externa, is mainly composed of collagen fibers that protect and reinforce the vessel, and anchor it to surrounding structures. 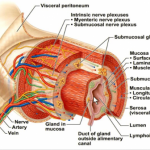 The tunica externa contains nerve fibers, lymphatic vessels, and elastic fibers (in large veins). In large vessels, the tunica externa contains a structure known as the vasa vasorum — literally, “vessels of vessels” that nourish external tissues of the blood vessel wall. Interior layers of blood vessels receive nutrients directly from blood in the lumen. This has been a basic review of blood vessel structure and function.